We have another picture leak exclusive today, and this time it’s of the upcoming new Samsung Galaxy Book 12 2018-2019 model. 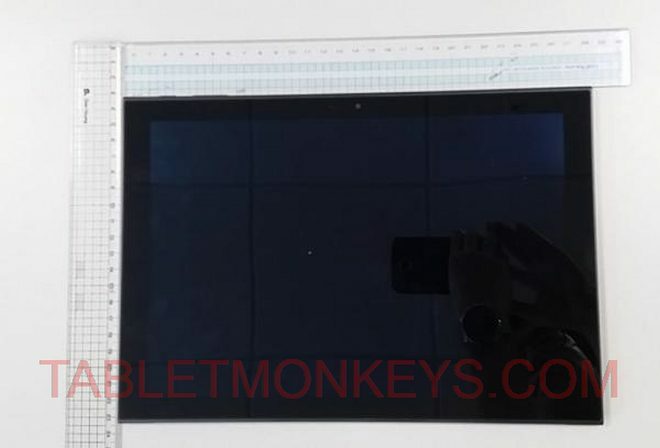 This is the tablet with the new model number series ranging from Samsung SM-W730, SM-W733, SM-W735, SM-W737, up to SM-W738, with this picture leak being of the Samsung Galaxy Book 12 (SM-W737 and SM-W738), though all versions in this model numbers series should look the same. The photo leak originates from an Asian regulatory body who certified and approved the new 12-inch Samsung Galaxy Book 2018-2019 model this week, so this AMOLED Windows 10 tablet is ready to be launched now during the fall as a successor to the Samsung Galaxy Book 12 that was released in April last year. What we learn from today’s leaks is that the the screen size should be the same exact 12 inches as before, since the outer dimensions are still approximately 290mm x 200mm, give or take a millimeter or two, which is the same size as the current Samsung Galaxy Book 12 too. The bezels are also of the same dimensions as before, so the screen can’t really be anything else than 12 inches, so we should continue to expect a Super AMOLED display with 2160 x 1440 resolution on the new version too. The frame of the tablet does look a lot more square now though, compared to the round corners of the two predecessors. The photo is take very closely and there is some barrel distortion in the picture, but even taking that into account, the tablet still appears as if it may have more square corners. We can see the power button and volume rockers on the top of the frame, and in the middle on the top bezel we can make out the front camera on the left and the light sensor on the right, and there should be a LED indicator in the middle of these sensors, though this is almost always invisible to the eye anyway unless it’s turned on while charging. A design change is that Samsung have removed their silver Samsung logo brand on the bottom bezel, so users will now simply be faced with a black bezel around the tablet on the new Samsung Galaxy Book 12. So those are the things we have learned yet. It will probably be launched with an upgraded Intel Core “Coffee Lake” processor, a new GPU, as well as faster RAM. The Samsung Galaxy Book 12 and 10.6 are Windows 10 2-in-1 tablets in the large-but-ultraportable category, so Samsung always have to keep that in mind when applying changes to them. So while specs are already high as it features a 4K camera, we have to wait and see if a switch from stereo speakers to quad-speakers will be a priority on the new Samsung Galaxy Book 12.